From an American perspective there are many unexpected and unique challenges when it comes to renovation projects here. Take, for example the logistics of something as simple as debris removal. Paris has been around for centuries. It is old and densely populated. Parking a dumpster on the job site is not an option. Not to mention just parking at the job site in general! 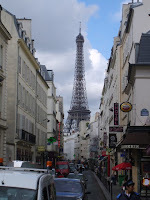 Things we take for granted in the United States are redefined by Paris; one of the senior cities of the Western World. But with every problem there is a solution and with that American work ethic we are able to develop, manage, and support a plan to get the job done. We can help you re-design your space to give you more storage and more living space. We specialize in making your home more livable, from designing custom furniture built directly into those small alcoves to moving walls to create a more open space. We have been making little places bigger for 15 years! We use state of the art 3D design software to show you exactly how its going to look before we even start our work. We specialize in building custom furniture to fit in what ever space you have. Since most building in Paris are old and the space is typically very limited we build custom pieces to fit into whatever space you have. Plumbing projects in Paris can sometimes be an odyssey of their very own. It is understandable that a small flat and/or old building can present a unique set of problems when it comes to access, storage and the drainage of water. Our team of plumbers are very experienced in all things Parisian and can present the best choices that will fit your needs. In the United States; most construction by European standards is new and most every room or situation is, within acceptable limits; relatively square. In Paris it exactly the opposite. Nothing is ever level, plumb or square! Our tiling experts have over 25 years of experience and can tackle any situation. From bathrooms to kitchens; from ceramic to marble; we can deliver on all your tiling expectations. Our experienced painters have over 20 years of experience, the are very detail oriented and very clean. The finishing touch to our work is extremely important to us and to you. We take great care to ensure its perfect.